To get some perspective on the relationship between team performance and team payrolls, I have gathered data for each season from 2011 until 2015 on player salaries from the widely-cited database available at Spotrac. These data are broken out by positional categories and include a figure for “dead” money, contractual obligations to players that are no longer with the team. The overall explanatory power of this model is pretty low. Just under 19% of the variance in wins can be statistically accounted for using these salary data. That’s just another way of stating what the graph in the main article shows, that there is a lot of “scatter” around the model’s predictions. Teams with identical payrolls can win considerably more games than the model predicts, or considerably fewer. After adjusting for the extreme cases, two changes happen to the effects of spending. 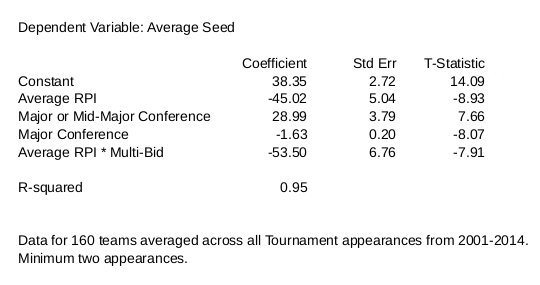 One, the coefficient for player salaries falls from 0.13 in the simple model without adjustments to 0.10 here. 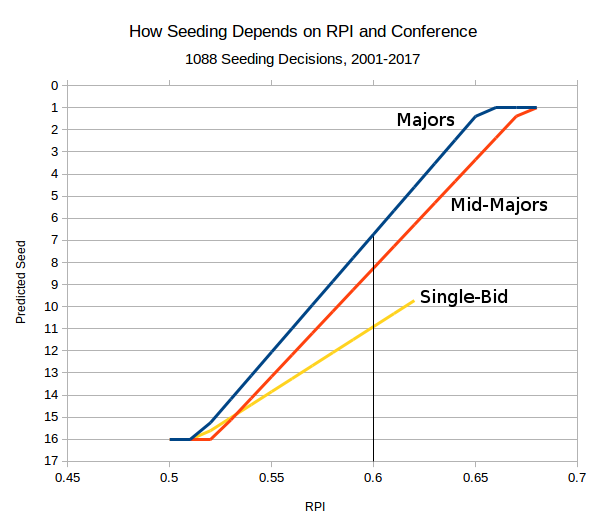 That suggests that an average team needs to spend about $10 million to gain another victory, rather than the $8 million figure based on the simple model. However a more nuanced view of the spending effect includes the coefficient’s “standard error” of 0.02. That can be used to construct a “confidence interval” around the estimated effect; the actual effect of spending is 95% certain to fall somewhere in the range between 0.06 to 0.14, the result of subtracting or adding twice the standard error. That means it costs somewhere between $7 million (7 x 0.14) and $16 million (16 x 0.06) to gain another win. Second, the portion of teams’ payrolls not devoted to players on the field now has the “proper” negative sign, though it still falls considerably short of conventional significance levels. 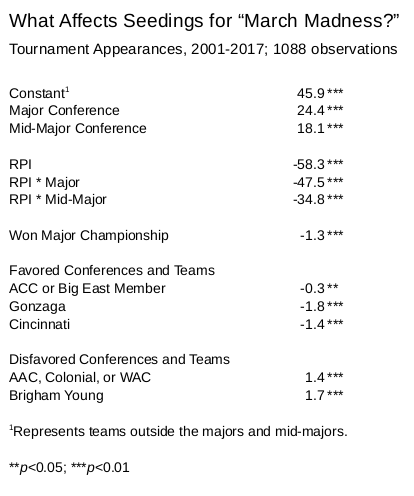 It’s possible that teams are penalized for making bad decisions that lead to large pools of “dead” money, but the evidence is still pretty weak, and the effect quite small. Finally we can ask whether spending on pitchers is more or less productive than spending on positional players. The answer is that it doesn’t matter. Including separate terms for both groups’ salaries adds no predictive power to the model. Spending another ten million dollars on pitching has the same effect as investing that money in the rest of the team. OLS does not have any special methods to handle “censored” information like seedings. The coefficients above predict seeds below one and above sixteen. A better alternative is Tobit with censors at one and sixteen. This model (with some minor adjustments to the intercept differences) generates the graph in the article. 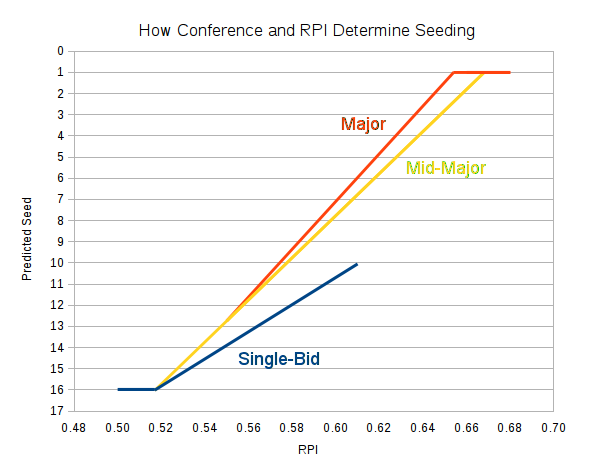 Estimates from this model show a greater difference between the majors and mid-majors than do the OLS estimates. 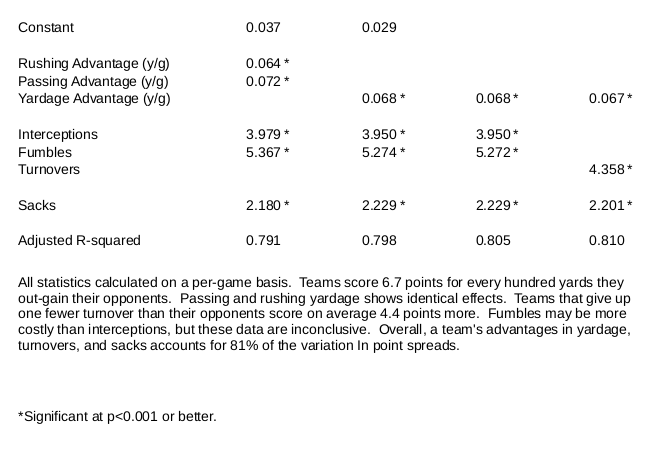 This table presents the results of a series of regressions using the average margin of victory as the dependent variable, and the per-game differences in yards, turnover, and sacks as the predictors. I found no statistical difference between yards gained rushing versus passing. The effect of a fumble may be greater than the effect of an interception, but we would need more data to determine any differences. Thus the final model includes only the net yardage advantage and treats all turnovers identically.